Two of seven men accused of conspiring to sell U.S. trade secrets to a major Chinese military contractor appeared in a Washington, D.C., courtroom Monday. Scott MacFarlane reports. Two of seven men accused of conspiring to sell U.S. trade secrets to a major Chinese military contractor appeared in a Washington, D.C., courtroom Monday. Federal authorities arrested 52-year-old Shan Shi and 31-year-old Gang Liu along Connecticut Avenue NW in May. They were accused of a scheme to sell trade secrets about a type of military equipment from a company based in Houston to the Chinese contractor. Court filings indicate the secrets involved a type of foam material frequently used for military projects. The scheme involved millions of dollars, prosecutors said. Federal authorities have tried to seize at least two properties in D.C. suspected of being used in the scheme. 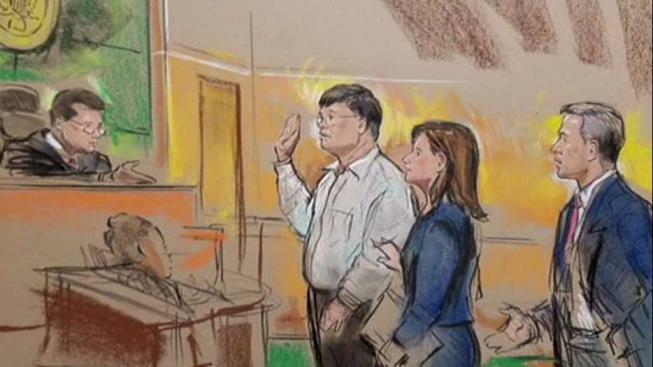 Shi and Liu, a Chinese national who lives in Houston, are charged with conspiracy. They each face 10 years in prison. Also charged were 35-year-old Uka Kalu Uche, of Spring, Texas; 74-year-old Samuel Abotar Ogoe, of Missouri City, Texas; 48-year-old Johnny Wade Randall, of Conroe, Texas; 40-year-old Kui Bo, a Canadian citizen who also lives in Houston; and 32-year-old Hui Huang of China, who works for the Chinese manufacturer implicated in the conspiracy. Attorneys for some of the men said they deny the charges and have already pleaded not guilty.